Subject: Tafel 33: Schnurleber, akuter gelber Leverschwund, Lebergelkrankeit, Leberkrebs. 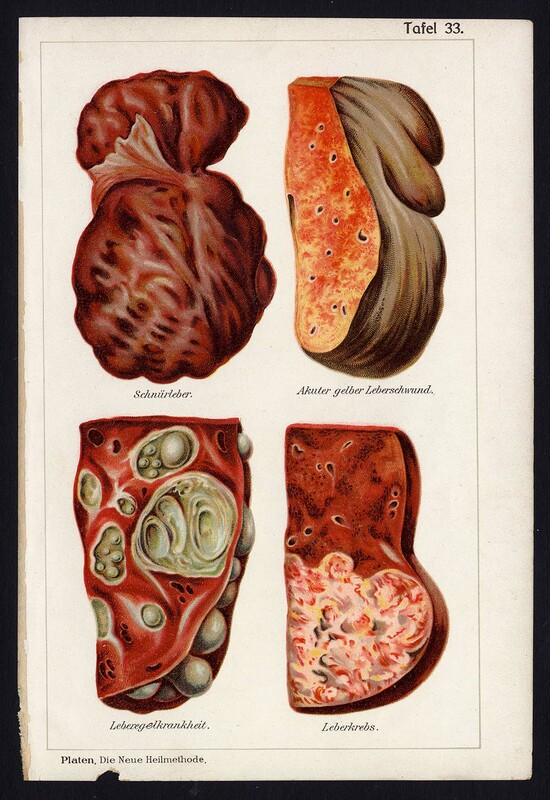 This plate shows several diseaes of the liver: acute atrophy, cord and cancer. Descriptive sheet in German included. Condition: Very good. General age related toning. Some light paper erosion from binding and some tiny remains of protective sheets that were originally bound into this work and sometimes got attached to the plates. Please study scan carefully. Medium: Original colour lithograph on a vellin type paper. Size (in cm): The overall size is ca. 15 x 22 cm. The image size is ca. 12.5 x 20.5 cm. Size (in inch): The overall size is ca. 5.9 x 8.7 inch. The image size is ca. 4.9 x 8.1 inch. Description: This plate originates from: "Die Neue Heilmethode, Lehrbuch der naturgemassen Lebensweise, der Gesundheidspflege und der naturgemassen heilweise", by M. Platen. This book was published in Berlin by Verlagshaus Bong, ca. 1907. Artists and Engravers: Artist and lithographer unknown.